Manufacture between 10 to 200 cubic pe day. Designed and supplied by ibeton -Russia. Make light weight concrete blocks or slopping roofs using a foaming agent from isoltech - Italy. complete plant unit with laser cut metal molds 600x300x100 or 600x300x125 or 600x300x150 or any other size. Customers mostly preferred to purchase quality products, so we are involved in offering best quality of Foam Concrete Brick Plant. 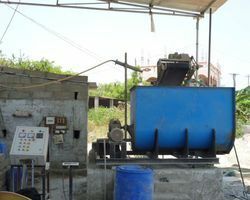 This Foam Concrete Brick Plant is extensively used in concrete blocks and panels for outer leaves of buildings, architectural ornamentation and in many other suitable applications. We wish to update you on the NEWLY developed foam concrete plant is PLUG & READY TO USE type, with integrated system of Mixer, Foam generator and Pump, working together.